Trains run regularly to the town on the branch line from St Erth which is on the Penzance - London main line. St Ives railway station is a short walk from the centre of town and the beaches. Local services are operated by First Great Western. You will find timetables on their website (see below). This is also a convenient route out of town if you want a day out. The local train stops at Carbis Bay and Lelant. 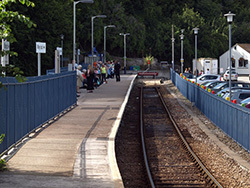 You can get connecting services from St Erth to Penzance, Camborne, Redruth, Truro and further afield in Cornwall. The St Ives Bay Line is regarded by many as one of the most scenic rail routes in Britain. You may want to take a return trip simply to enjoy the views of the beaches and the Hayle Estuary. The Rail Ale Trail offer a guide for a pub crawl by train. This includes details of 14 different pubs along the route between St Ives and Penzance. They also have a guide to the St Ives line and others. There is a taxi rank at St Ives Station but you will often face a long wait, so if you need a taxi you would be wise to book in advance - try DJ Cars. There is no car hire facility at the station, but you can hire one from St Ives Car Hire who will be happy to deliver your car for collection on arrival. Click on the blue placemarkers for details of each station. Click + or - to zoom in or out. Click 'Map' for a map view. St Ives Cornwall - Railway Station - Copyright © Tim Marshall and licensed for reuse under this Creative Commons Licence.